We know from Friday’s post that 89% of you are federal wage and hour minimum-wage all-stars. 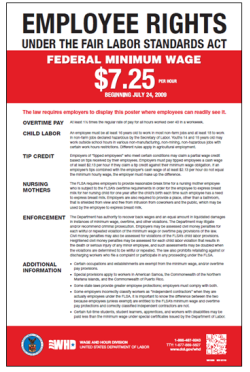 To celebrate, and because I love each and every one of you, the least I could do is hook you up with the U.S. Department of Labor’s new Fair Labor Standards Act (FLSA) Minimum Wage Poster. And, while you’re at it, make sure that you get the updated Employee Polygraph Protection Act (EPPA) Poster. Same rules apply about hanging it in prominent locations. Here are links to the EPPA poster in color and black and white.